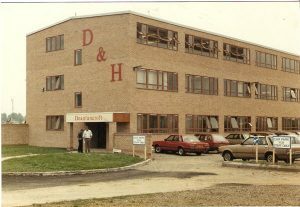 Commercial building constructed to be new Head Office for respected building company in Cambridge which comprised a three storey Head Office, Stores building and 8 bay Garage with Workshop. Designed by Nick Lane and others, and given the name Deanlancroft in recognition of the involvement of Nick Lane. Drawings for the site and buildings. Planning application and liase with planners. Contract management for trades etc. for build. Project management to oversee the build. Construction of 3 storey Head Office, Stores building and Garage Workshop building. See Building Project Portfolio: Architect Designed Houses, Demolition then Build, Extension and Renovation, Grand Design House, New Build Houses, New Houses Project Managed.